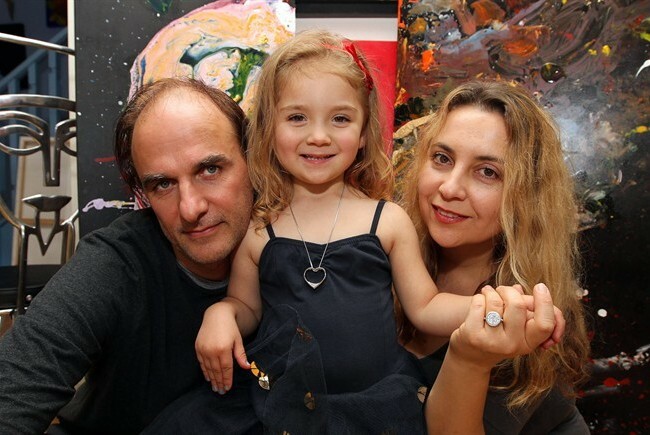 Aelita Andre is an Australian abstract artist known for her Surrealist painting style and her young age. She began to paint when aged nine months, and her work was displayed publicly in a group exhibition shortly after she turned two. Her first solo exhibition opened in New York City in June 2011, when she was four years old. Andre was born on January 9, 2007 in Melbourne, Australia to Australian father Michael Andre and Russian mother Nikka Kalashnikova. As a baby, she often watched her parents, both artists themselves, work on canvases on the floor. She learned to paint before she could walk, several months prior to her first birthday. She and her family currently reside in Melbourne. Aelita’s parents first realised Aelita had a natural talent for painting one day when Aelita was only an infant. Her father Michael recalls, “Before Aelita was born I had dabbled in painting on and off as a pastime.” He lay the canvas down in the family room and was about to begin painting when Aelita, still a tiny infant, crawled onto the canvas and without any hesitation began squeezing the tubes of paint and delightedly yelling and laughing smearing and dabbing paint across the canvas. It was instantly evident she loved her newfound activity and the effect she was creating, smiling and joyously babbling the way an infant does. Her eyes glanced from one point to another absorbed in the act of painting; the sheer pleasure. Her father stood up and looked at her painting instantly struck by the beauty of his daughter’s work. She had created an extraordinarily beautiful painting – a genuine work of art – the work of a mature abstract artist. The painting was innocent and liberated yet mature and masterly in its execution and effect. Aelita Andre had hit on something fully formed, a style that has grown and developed and branched out and continues evolving to this day. Andre’s mother, believing her daughter to be a child prodigy, showed some of Andre’s paintings to a Melbourne-based art curator when the girl was 22 months old. Impressed with the work, the curator agreed to include it in a group exhibition in the Brunswick Street Gallery, and he began advertising the show with Andre’s paintings before he learned of her age. Although he was surprised, he kept his promise to display the work. The show opened shortly after her second birthday and also featured Kalashnikova’s photography. Several months later, Andre and her parents visited Hong Kong, where she sold her most expensive painting to date for $24,000. Nikka sought the opinion of a professional gallerist, approaching a highly regarded gallery in Melbourne, Australia, showing the curator several of Aelita’s paintings. He loved what he saw and insisted on exhibiting them. Nikka told her husband that not only was the curator impressed but insisted on exhibiting all Aelita’s paintings in an upcoming group exhibition. Nikka added she didn’t mention Aelita was a toddler – at that stage a twenty-month-old, confessing she didn’t know how to tell him, so didn’t mention age at all so as not to prejudice the curator’s attitude to Aelita’s paintings. 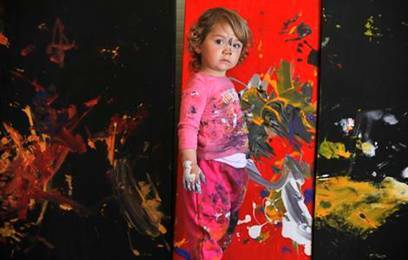 Aelita was a one year old with sixteen of her paintings now officially part of an exhibition in a commercial gallery. In November 2013 Aelita painted live in front of 20,000 people in the LDS Concert Hall in Salt lake City, Utah. She loved the audience attention and created an amazing painting attaching a real violin to the canvas which she played while it was glued to the painting. In February/March 2014 Aelita staged a solo exhibition in the prestigious Yan Gallery in Hong Kong and also at the Asia Art Fair in Hong Kong.